This month is flying by - with snow days, holidays and theme days there is hardly any time left for teaching! 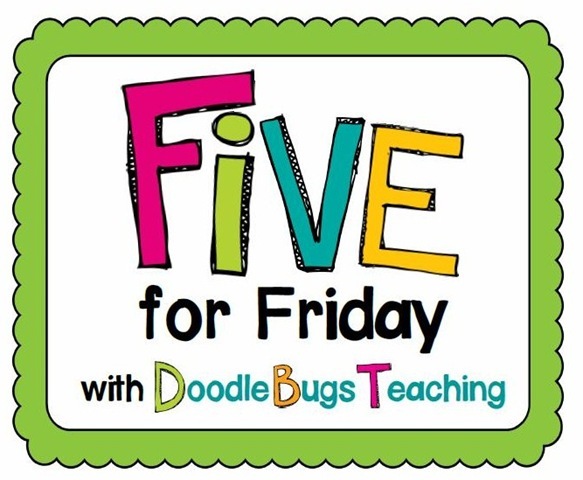 #1 - Fantastic new math resources. I got the super "Superhero Problem Solving Posters" from Collaboration Cuties as part of their great giveaway. 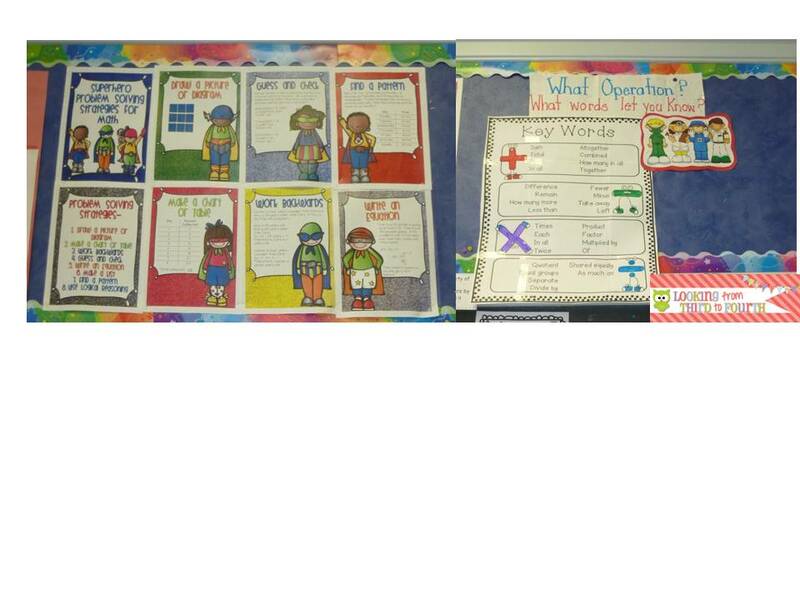 I love them - because they are fantastic too look at but also because they have great info for the kids to use. I also like them because I am moving towards a Superhero theme in all of my math posters and these fit in perfectly. I received a copy of Tonya's (of Tonya's Treats for Teachers) Math Journals. She is incredibly generous with her teaching ideas and resources. I can't believe she includes a ppt version of her file so that teachers can edit it. I took her page on key word and turned it into a poster for my kids to refer to... which we did and I love it! #2 - We are actually moving on in our division unit. We are learning and using strategies - yeah us! Here are some of the strategies we have covered. I got this idea from Young Teacher Love (only hers is way better) and immediately implemented it - like the very next morning! 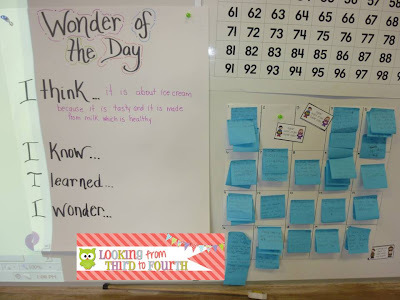 I use it to collect our statements for the Wonder of the Day from Wonderopolis and will be using it whenever we write our connections or questions or answers on sticky notes. I made a grid on bristol board, numbered each square (rectangle, whatever!) 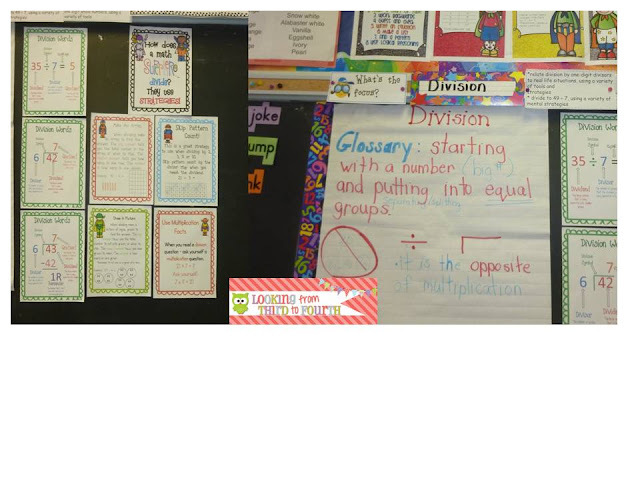 and whenever we use sticky notes the kids post their responses in their square (each student was given a class number in September). It is so much neater and easier to read and quickly assess then my old method of letting them post it anywhere on the board or near the question! I love that my kids love this site so much they are going on at home, with their families and posting comments. They have totally become hooked on these quick non-fiction articles. Love the chocolate, love the excitement over little cards and treats. Love how kids think that work is so much more fun if it is Valentine-themed. 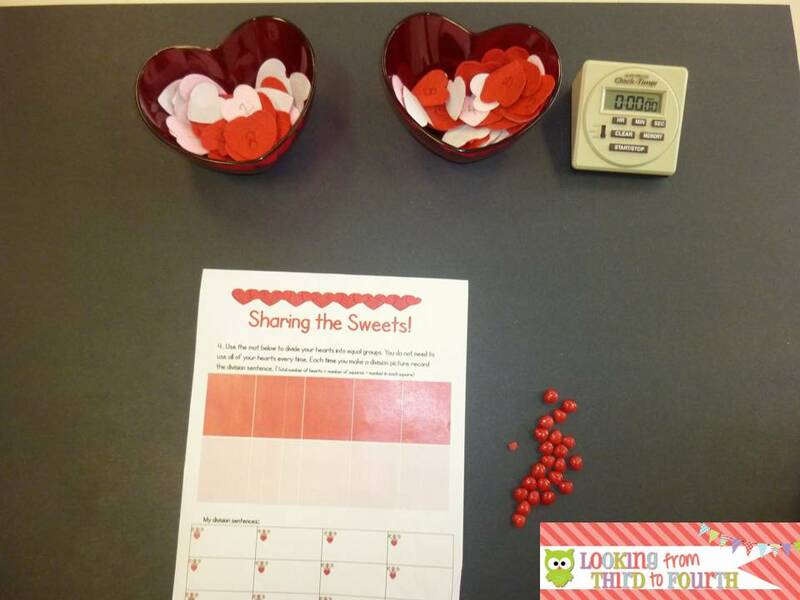 We used the division freebie I shared on Monday - we used candy hearts and the ten frame to create division sentences - then of course we ate the hearts! Then we wrote multiplication facts using felt hearts from heart containers (an idea I saw at 4th Grade Frolics). I wrote numbers from 0-10 on hearts and put them in containers - the kids had to take 2 hearts, write a multiplication sentence, return the hearts and grab two new hearts. I used the timer to add excitement (as many as they could get done in three minute intervals). They were so pumped to multiply as many as they could and would shout out if they got the same numbers or a really easy one or a double like it was so exciting. There was running and cheering. After every 3 minute mark we would exchange our work with some one to check and then start again. I am linking up with DoodleBugs Teaching for her awesome weekly linky party. Head over there for more great ideas - I know I always find some great ideas! I've never used Wonderopolis - but it looks interesting! I might just have to add it to my classroom website! I keep hearing about Wonderopolis and it is about time I checked it out! Thank you for the reminder:) I love the sticky note idea organized into squares. Have a great weekend! Just found your blog and I'm LOVING it! You have a NEW follower! I too got the Collaboration Cuties posters. Haven't printed them up yet but we have hardly had school lately!